Most online tutorials that I have found describing the process of creating, burning, and mounting ISO image files are written separately or are only about doing one process, so this guide is going to describe some free software that you can use to create and manipulate ISO images files for all purposes. Basically, the software is split into three categories: software to create an ISO image file from a folder on the hard disk or from a CD/DVD, software to burn an image file to a CD/DVD and software to mount an image file as a drive in Windows. There are two free software applications that are very lightweight and get the job done quickly when it comes to creating ISO images: Folder2ISO and ImgBurn. Folder2ISO can be used to burn a folder to a CD or DVD. Actually, Folder2ISO takes your folder and creates an ISO image file first, then you can burn that ISO image file to a CD or DVD. You might be wondering what is the point of creating an ISO image of a folder and it’s really only useful when you’ve used a program like DVD Decrypter to extract the contents of the DVD onto your computer. Usually, you’ll see two folders under the movie folder called VIDEO_TS and AUDIO_TS. To use Folder2ISO, simply click Select Folder and choose the folder you want converted into an ISO image. Then click Select Output and choose the destination folder. Finally, type a name for your ISO image file in the label box. Click Generate ISO and your file is created! In addition to creating an ISO image from a folder, you can create ISO images from CDs or DVDs that you might have laying around. You can use ImgBurn for handling this case. Once you install it and run it, you’ll see a couple of options, two of which are Create image file from disc and Create image file from files/folders. So as you can see, ImgBurn can also handle what Folder2ISO does by itself. So what’s the purpose of creating an image file from a CD or DVD you ask? Well, it’s great for backup purposes in case you lose your original CDs or DVDs. Basically, you can mount the image as a virtual drive on your computer at a later point and run anything off the CD just as if it were the actual CD itself. So if you buy Photoshop and create an image file, later on if you lose the CD, you can burn the image file to another CD and it’ll work exactly the same as the original CD or you can mount it and run the install straight from the ISO file. Well, if you ran ImgBurn, you probably realized it can do a lot more than just create ISO image files! It can also burn images files too! Once you have created your image file from the method above, just pop in a CD or DVD and choose Write image file to disc. Go ahead and select the ISO image for the source and choose your CD/DVD drive as the destination. You’ll need to have a disc inserted in order for the burning button at the bottom to not be grayed out. That’s pretty much it for burning ISO images! Finally, if you have downloaded an ISO image file or if you have created one from a CD or DVD, to actually use it on your computer, you have to mount it. 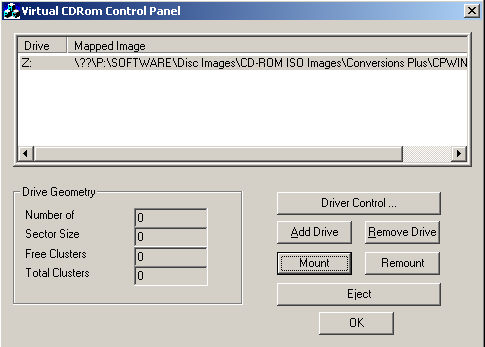 Mounting an ISO image simply means creating a virtual CD/DVD ROM drive that Windows will then access just like the physical CD/DVD drive. There are also two free ways you can go about doing this: one program is a small utility from Microsoft called Microsoft Virtual CD-ROM Control Panel and the other is Virtual Clone Drive. I would suggest just using Virtual Clone Drive because the Microsoft tool is about 13 years old now and it doesn’t even work on 64-bit operating systems, just 32-bit. Plus, the instructions for installing it are a pain, but if you really want something from Microsoft, it still exists! Basically, you choose how many virtual drives you want and then go down to the taskbar and right-click on the tray icon. It will automatically pick the next free drive letter and show that in the options. Click on the drive letter and then click on Mount. Choose your ISO image and you’re all set. You should also know that in Windows 8 and Windows 10, you no longer need any third-party software for mounting ISO images because support is now built-in. You can read my post on how to mount ISO images in Windows 8/10 for full instructions.